Washington, DC – Today, Safer Chemicals Healthy Families released a new report, "Who's Minding the Store? -- A Report Card on Retailer Actions to Eliminate Toxic Chemicals," the first major evaluation of the United States' largest retailers' safer chemicals programs. The investigation revealed that while some leading retailers are making significant progress to move the market away from toxic chemicals, other top retailers remain serious laggards. Major U.S. retailers earned grades ranging from B for good progress to F for failing to develop and make public even basic safer chemical policies. The average grade was a D+, indicating a significant need for improvement by retailers to meet rising consumer demand for safer products. Of the eleven retailers evaluated, three retail leaders are setting the pace for the entire sector by making meaningful progress toward safer chemicals and products. Walmart, Target, and CVS Health received the highest grades and have developed and made public the most robust safer chemical management programs during the past three years. Meanwhile, other large retailers remain serious laggards. Amazon, Costco, and Albertsons all earned failing grades. Amazon received the lowest grade of any retailer evaluated, accruing only 7.5 out of 130 possible points. Meanwhile, Amazon's market share is rapidly growing and the company is projected to soon be the biggest retailer of apparel and electronics in the U.S. The report card reveals for the first time significant improvements made to Target's chemical policy over the past year. The company: 1) Added cosmetics to the categories of products covered by its policy; 2) Expanded the list of chemicals subject to its policy to include chemicals banned in cosmetics in the European Union and Canada; 3) Significantly improved its evaluation of suppliers' transparency practices, particularly a new way for Target to evaluate fragrance ingredients against its restricted substance list; and 4) Added new criteria pushing suppliers to publicly disclose their fragrance palette, allergens in fragrance, and nanomaterials. The report card also reveals for the first time that CVS Health has become the first pharmacy chain in the country to become a signatory to the Chemical Footprint Project. Additionally, CVS Health has pledged to publicly disclose its restricted list of chemicals in 2017. Best Buy also disclosed it is developing a safer chemicals policy, restricted substance list, and manufacturing restricted substance list, to drive harmful chemicals out of electronics. In addition, SCHF provided recommendations for retailers including developing public written safer chemical policies, reducing and eliminating toxic chemicals, embracing "radical transparency," and requiring reputable third-party safer chemicals standards such as "Safer Choice" and "Made Safe" aimed at promoting healthier products. Mike Schade, Mind the Store Campaign Director of Safer Chemicals Healthy Families, and report co-author said, "As the holiday shopping season approaches, consumers should pay close attention to how big retailers are tackling toxic chemicals. Our new report found that some giant retailers like Walmart, Target, and CVS are taking meaningful and concrete steps to systematically drive toxic chemicals out of products. However, too many others like Amazon, Costco, Albertsons and Kroger have failed to make public even basic safer chemical policies. The eleven retailers we evaluated have combinedsales of over one trillion dollars, a market power that can transform the toxic chemical economy." Mike Belliveau, Executive Director of Environmental Health Strategy and Senior Advisor to Safer Chemicals Healthy Families, and report co-author, said, "Big retailers are on the frontline of consumer discontent with product safety. Parents are more aware than ever that our chemical safety system is badly broken. When out shopping, no one should have to worry that the shampoo, lotions, cleaners, clothing, shoes, or home electronics contain toxic ingredients that could harm their family's health. Retailers must send a stronger signal up their supply chains - no more toxic ingredients. And consumers should use this report card to decide which retailers to patronize. Where would you rather shop, at a retailer that scores a B or the retailer with a red F for failure to ensure their safety of their products?" 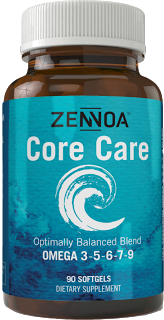 For more information about Omegas and Zennoa Core Care, click here. Labels: Best Buy, CVS, retailer report, Target, toxic chemicals, Who's Minding the Store?